Over the past few decades, KFC has slowly worked to become a Christmas tradition in a country that didn't traditionally celebrate the holiday. But, many cultural observers have noted that KFC becoming synonymous with Christmas in Japan is a 'lost in translation' of moment with the multinational corporation exploiting a western tradition to sell chicken dinners. However, you see this phenomenon unfolding, it's hard to deny the brand's popularity during this time of year, which has led KFC Japan to make increasingly elaborate ad campaigns each year for its Christmas dinners that people across the country line up for each year. 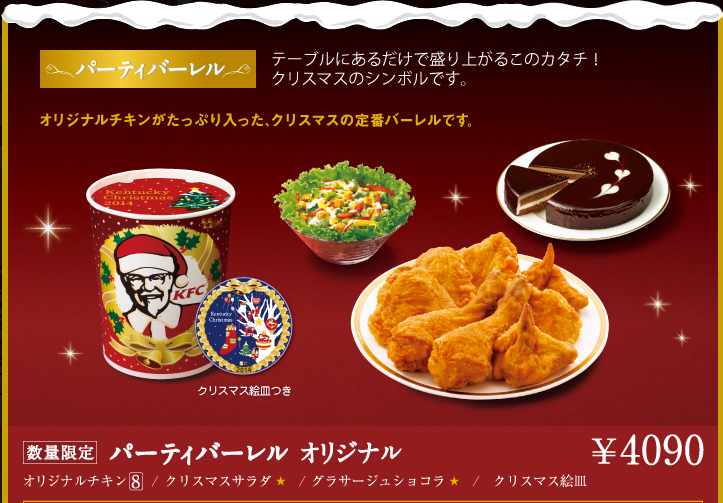 Arguably, the yearly ad campaigns and lining up to order said Christmas dinner has made KFC a big part of Japan’s holiday season. How did this tradition start? The official KFC story is that a Christian kindergarten class in Japan ordered KFC for its Christmas party in the early 1970s. The store's manager decided to be extra Christmas-sy and delivered the meal as Santa Claus, which brought much joy to the children. In 1974, KFC launched its first Christmas dinner ad campaign and a new Christmas tradition was born in the country.